Anti-Icky-Poo Unscented uses a combination of enzymes and live bacteria that literally consume most types of decaying organic materials including urine, feces, vomit, sweat, skunk musk and dead animal smells. It works safely and effectively on carpet, wood, tile, plastic, fabric, dry wall, cement and almost any other surface material. 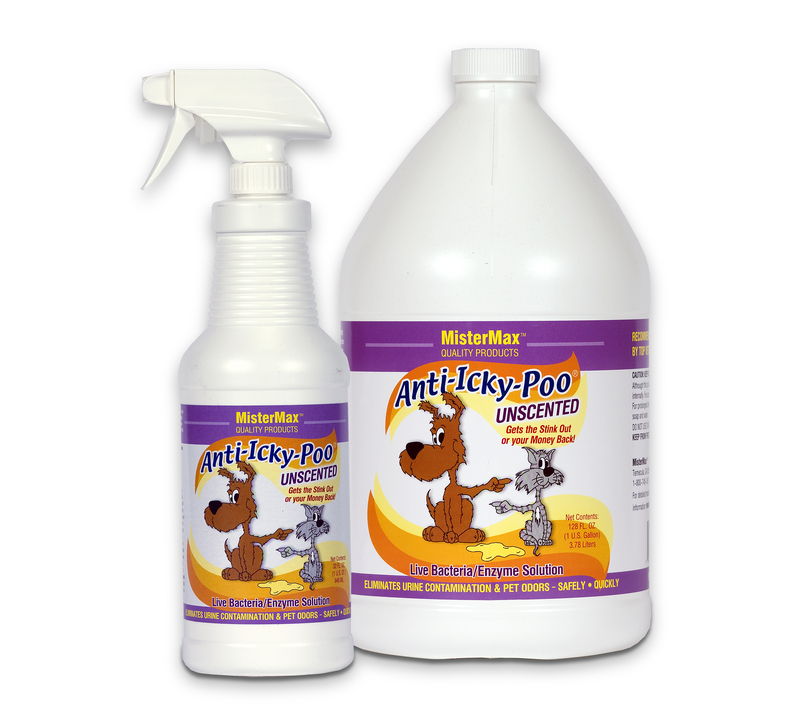 Anti-Icky-Poo is eco-friendly and environmentally safe. If you have an odor problem, we will guarantee that Anti-Icky-Poo will provide the solution, no matter how long the order has been in that location. Anti-Icky-Poo Unscentedis designed to eradicate urine crystals and digest any malodorous decaying compounds. We promise to succeed in permanently removing your odor problem by consuming the sources of the contamination safely, effectively, and swiftly. 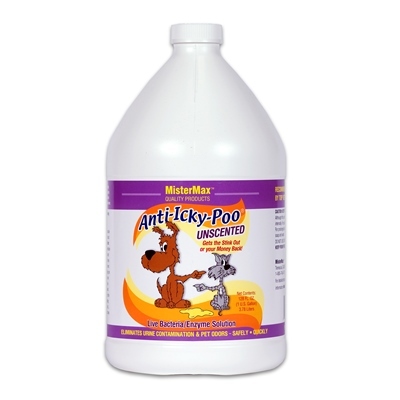 There is no rubbing or scrubbing or mopping up after applying Anti-Icky-Poo. Just Spray and walk away. Better yet, spray and go relax for a few hours. For best results, spray the entire affected area in 2 – 4 hour intervals the first day (depending on the extent, source and age of the contamination) and 3 – 5 hour intervals the second day. On the third day, spray the contaminated area if you continue to smell odors. Your own nose will tell you when you when the odors are gone. Anti-Icky-Poo Unscented costs the same but works far better than the best selling national brand. If other products have failed you, Anti-Icky-Poo Unscented is here to help! Anti-Icky-Poo Unscented is 100% performance and satisfaction guaranteed. Our product works safely on every material from silk to concrete. One customer successfully used Anti-Icky Poo Unscented on her Louis Vuitton hand bag. Use Anti-Icky-Poo Unscented first and after the odor is gone, clean the area as you see fit. The directions are simple. Just spray and walk away! Anti-Icky-Poo Unscented will do the hard work for you. I love this product! It has been the only one to stop odors. It does need to be used before any other product for best results. I used it years ago, and found it again, after other products have not been working. It does what it promises. It gets rid of the cat urine smell. No kidding...it works! I use it to deodorize litter boxes once they are washed out (I let the Anti-Icky-Poo dry and then rinse out theboxes again.) I use it to deodorize after washing the floors in the litter box areas. I have used it to save a suitcase a friend's cat peed on (took some persistence, but it worked). 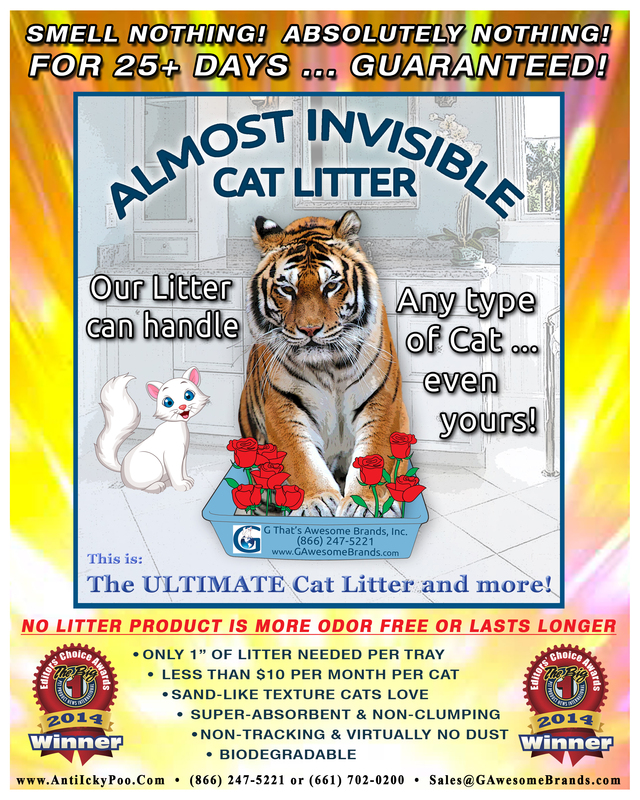 Now that my cats are older, I rely on it to clean up litter nox misses, etc. PS: the shipping was super-fast! This is by far the best cat urine removal product I have ever tried! It even took the scent out of a spot on my mattress. I wish I'd known about this stuff years ago. I learned of Anti Icky Poo a number of years ago from a wonderful cat behavior specialist, Marilyn Kreiger the cat coach. At that time, one of our cats was pooping on the floor right next to the always clean litter box. I was at my wits end, but Anti Icky Poo saved the day, and my carpet. Fast forward 5 years, my 9 year old cat has started spraying the sofa, my husband, and even peed on the guest room bed twice. (Yes, we've been to the vet to see if anything is physically wrong.) My husband was sure we were going to have to get a new bed in the guest room, but Anti Icky Poo came to the rescue again. I treated the affected area twice per day for 3 weeks and the bed is like new. Don't waste your money on any of those other products. Anti Icky Poo (I prefer the unscented) is the only product that truly works. Thank you! So I got married, moved to a new apartment and brought my cats with me. Well my 9 year old didn't appreciate all the changes and he quit using the litter box and started using my couch exclusively!!! So I tried everything and nothing was saving my couch and my husband was starting to talk about getting rid of my kitty (who I had since he was 4 weeks old). Well after 3 gallons of Anti-Icky poo, my couch is saved, my kitty is using the litter box again and my husband is happy. This is the best stuff and I have used everything out there as I have had kitties for 18 years. I will not use anything else and I have recommended this to everyone I know. This is the only product which really does take the odor out. Cats do not go back to areas treated! I was recommended to use Anti Icky Poo by my vet when I was at my wit's end with what to do with an aging cat who couldn't always find the litter box. This product makes our lives livable. I'm able to clean up the messes that occur and eliminate any trace or odor. Truly miraculous.